Touring version of the Boxster and Cayman combines the smallest engine with the best specs. Porsche hasn't traditionally offered quite as many variants of the 718 (before or since it received the numeric designator) as it has of its big brother, the 911. But taken one step closer with , shown to the public for the first time at the Geneva Motor Show this week. Available as both a convertible and coupe, the T variant is actually one of the least powerful versions on offer, packing the smaller 2.0-liter turbo four from the base model instead of the larger 2.5-liter unit from the S and GTS models. So instead of 350 or 365 horsepower, the Touring model offers just 300. Yet we'd still be tempted to pick it over its more potent siblings. And that's because, as far as the "baby” Porsche goes, the T is the purist's choice. Despite the small engine, the 718 T comes with the active suspension (lowering its ride height by 20 millimeters), the Sport Chrono package, a mechanical locking rear differential, and a proper six-speed manual (though you can still get it with the PDK). But what sets the 718 T apart from the rest of the range is the little things. Like the little fabric door pulls (instead of handles), the mixed-material sports buckets, the smaller steering wheel, the 20-inch alloys, the chrome-tipped dual exhaust tips, and the no-cost infotainment-system delete option. But perhaps the best pat of all is that it's cheaper – about 5 to 10 percent less expensive than a similarly equipped base model. 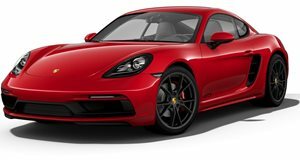 And that means more money for gas and tires, both of which we'd likely burn through as quick as the 718 T covers ground, running to 60 mph in 4.7 seconds with the PDK or 5.1 seconds with the manual and topping out at 171 mph.